In August the young of the year are getting ready to leave the area where they were born and find a new territory. Unfortunately, not many of them survive. This little guy was hit by a car. A gentleman stopped when he saw the pup laying in the road, and intended to move him off of the road, thinking he was deceased. Imagine his surprise when he grabbed the foxes rear legs and lifted him up to set him in the grass on the side of the road- and the fox moved its front legs! 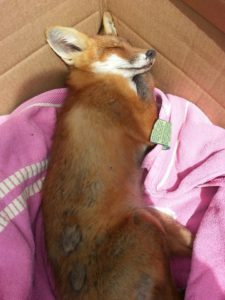 Immediately he wrapped the fox in a towel and placed it in a box and began making phone calls to look for help for the fox. Once Fox Wood Was contacted, we quickly made arrangements to meet. 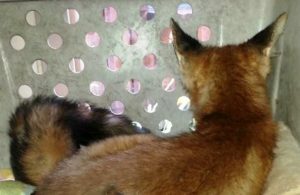 The fox was then immediately rushed to a wonderful veterinarian who we work with. He was carefully examined, X-Rayed, and found to have head trauma, but no broken bones! Fluids and a steroid were given, and a long acting antibiotic was given. There was not much else to do but wait and pray. Day One, the fox remained unconscious. This is only day 3, so stay tuned…. 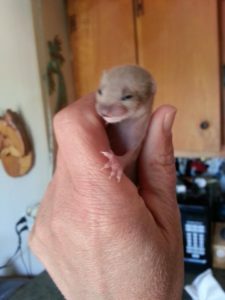 The weasel was released over the weekend. I’m sorry I don’t have pics of the release for you, but she was VERY wild and very elusive and I must respect that. She entered life in the wild via a process called “Slow Release” where she is given the opportunity to familiarize herself with the surroundings in the safety of her cage, and then the door is opened and she is allowed the freedom to come and go as she pleases. 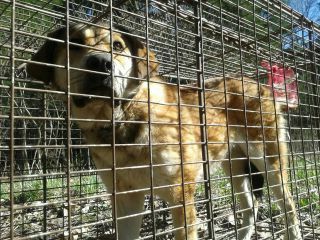 Food, water and a familiar shelter for her were provided for her to come back to as needed. I won’t reveal the location, but it is excellent weasel habitat, loaded with mice. 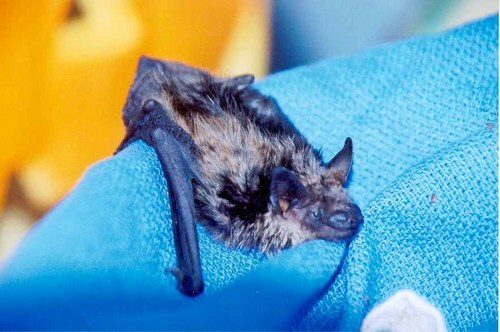 Above are a couple photos of her being raised. As she became a young adult, her natural instincts began to reveal themselves and she did not want to be handled and began to become more secretive in her movements. Though followers would have loved to see her all grown up, my responsibility to her is greater, so that is why there were no more photos of her. I appreciate your understanding this. One of the things that you will find we do NOT do here at Fox Wood is exploit our wildlife. We don’t get the donations that result from the exploitation of displaying animals in uncomfortable public settings or putting them on public display here at our facility. What we do here is strictly for the animals, not for the money, not for our ego’s. That is what sets Fox Wood apart. We rely only on donations from people who understand what we do and why we do it. In May and June Fox Wood receives many calls from well meaning people who are worried about an “abandoned fawn”. It is important to know that fawns are born with a natural defense mechanism. 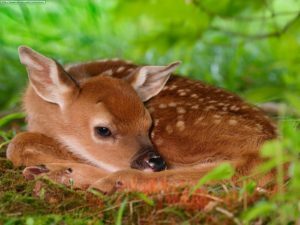 When fawns are first born they have no appealing scent to predators and they have an amazing ability to lay perfectly still and quiet, allowing the fawn to hide in plain sight. The mother deer does not stay with her fawn because she does not want to alert predators to her baby’s location. She comes back to her fawn throughout the day and night, but only when it appears there are no humans or other predators around. She feeds and thoroughly cleans the fawn to erase any scent they may have. Instinctively the fawn knows that when mom leaves, it must lay very still and silent in the location mom left it. Since the fawn does not move and no mother is present, people often think it is abandoned. Because of this, healthy fawns are often “kidnapped”. A doe may keep her babies in the short grass area, near your home, in your garden, etc. for the first 3 days, not in the woods where the predators are hunting. These first days a fawn can’t outrun a predator, so they go limp when someone picks them up. They are not dying, they are playing “possum” so you will not be interested and put them down. With twins, a doe will leave one baby in one place, and then 300-500 feet away, she will leave the other. She then goes off to the closest hiding area and forms a triangle so she can watch over both, unseen, until it is time to feed again. She will not let them travel with her until they are old enough to keep up with the herd, but she is never far away. A Very Rough Winter for All Wildlife! This opossum was found on the side of the road in a snowbank, too weak to move because she was starving. I gathered her in a towel and brought her home. For the first couple days it was touch and go, and I was only able to feed her small amounts of chicken noodle soup. 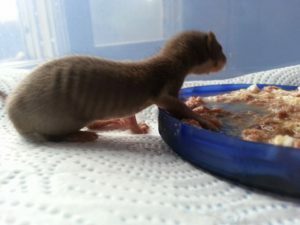 She started regaining some strength, and soon started eating on her own. She will be released as soon as the weather breaks and there is plenty food around for her. First Red Fox Pup of 2015! The first Red fox pup of 2015 is here! 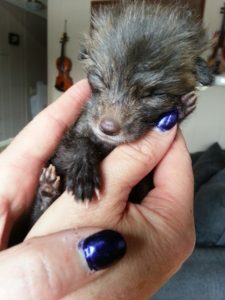 He is almost three weeks old and was brought to Fox Wood by someone who at first thought they were raising a domestic puppy. He wasn’t fed the right foods from the start, so we are trying to get him back on track. 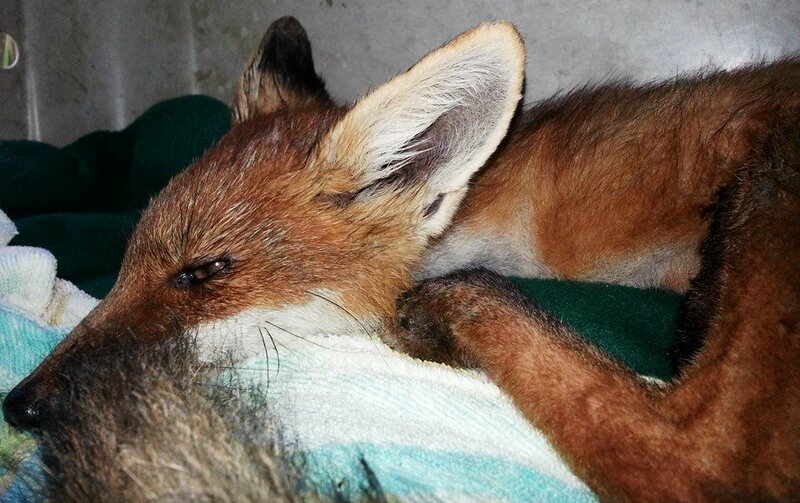 When he is old enough, he will get to join some of our wonderful foxes who love to raise the babies. 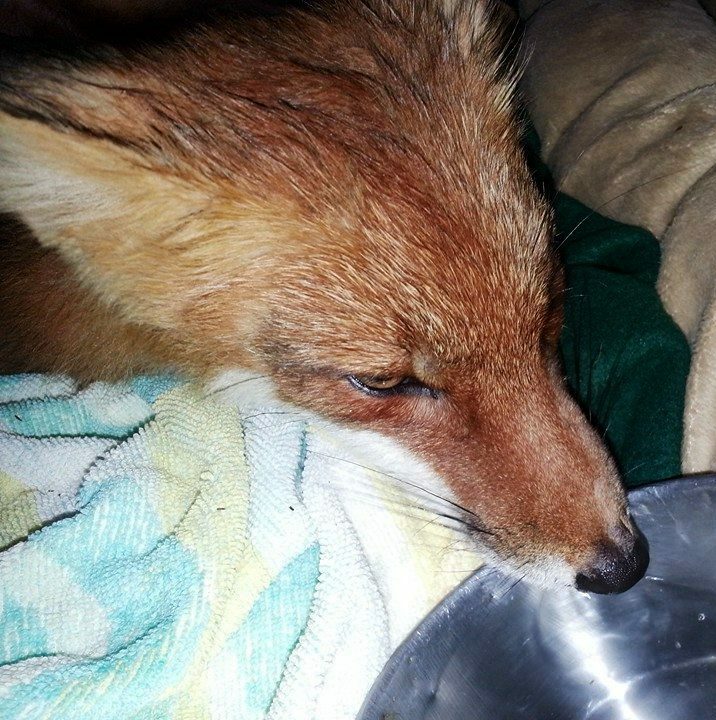 Coyote and urine can be used to humanely save lives! January, February, March, April and May are the best times to use predator urine to get unwanted wildlife families to move from unwanted areas. Coyote urine can be used to get a mother fox, raccoon or skunk to move her young. This will save you money, aggravation and neighbor complaints, by convincing the mother of the young that she must move her babies to a safer location because the coyote urine will make her think that they are in danger where they area. Through the years, I have gathered urine soaked bedding material from my coyote pens to give to people that were having issues with wildlife. They have used the urine to encourage raccoon mothers to safely relocate their young without having to trap the female and then destroy the young left behind because they didn’t realize she had young. In New York State, wildlife rehabilitators have to be specially licensed to raise orphaned raccoons and because of the prohibitive requirements only a handful of rehabilitators for orphaned raccoons exist. These rehabilitators get filled up to the maximum # of baby raccoons they can handle very early in the year. that leaves hundreds of thousands of orphaned baby raccoons and the people who find them without options. These numbers could be greatly cut if people would use a combination of light, noise and coyote urine soaked bedding material to encourage momma to find another location to raise her young. Many wild mammals do not want to keep their young in an area where there are predators such as coyotes and foxes. Foxes don’t want to raise their young where there is a coyote roaming nearby. If a coyote finds a littler of young fox, it will kill them. They do this to ensure there is enough prey for their own pups. Sprinkling coyote urine soaked materials near a red or gray fox den will encourage momma fox to move her pups to a “safer” location. Recently, a friend of mine had chipmunks chew the wire harness of his brand new truck causing some very expensive repairs that were not covered under the warranty. It seems the new harness coating is “environmentally friendly” and tasty to rodents. He had the problem repaired, with new “environmentally friendly” wire harness coating. Worried it would happen again, he picked up some coyote urine soaked material and put it into a metal box with holes in it. He placed this under his truck in the parking spot. Interestingly enough, not only have chipmunks not chewed the new harness, but he hasn’t even seen a chipmunk anywhere near his house since. Prior to that, there were many, many of them in his wood piles and such. Many people have come to get coyote urine to keep deer, rabbits and woodchucks from eating their garden vegetables, hostas and flowers. I am offering coyote and fox urine soaked bedding to the general public via my website “Tip Jar” . 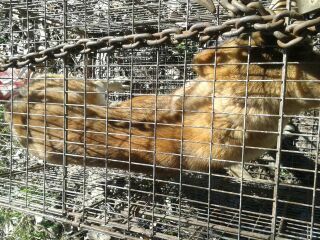 It is a cruelty-free product and unlike the fur farms and trappers where coyote and fox urine is gathered now, my coyotes and foxes live comfortable happy lives at my sanctuary. 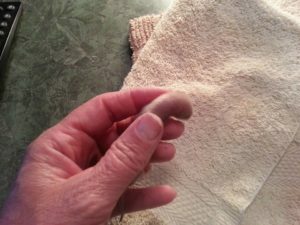 Call it “happy pee” if you want, but it sure works, and smells and performs better than the bottled stuff created by animals under stress or killed. I will gather it fresh when I get a request, and ship it out that day. The money raised will go straight toward the care of injured and orphaned wildlife and also for making the living conditions for the permanent coyote and fox residents better and happier for them. The first pup of 2014 was grabbed from her birthing den by a Jack Russell Terrier. 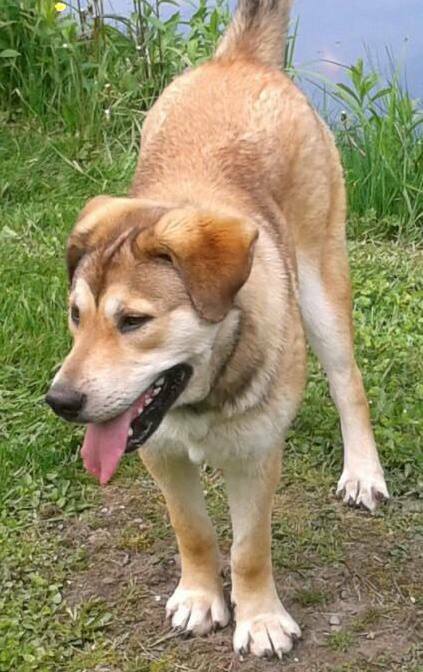 She was named “Sochi” by a supporter. We got her at just 2 days old! She is being fed every two hours around the clock! 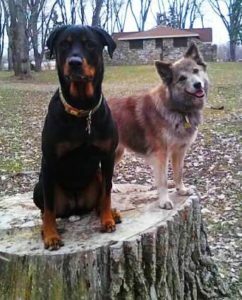 Adam and Lydia Pulka lost their beloved dog, “Denali” on June 2, 2012. They would like to honor Denali’s life by making a difference for other dogs in need. Adam and Lydia wrote the following about Denali and all that they went through with her. As many of you know, Denali was very special to us. She helped us get through many transitions in our lives, such as, but not limited to, moving to North Carolina and then moving back to Buffalo to begin our teaching careers. Her sister, Laila, misses her very much, as they were best of friends. This past year, Denali fell sick to cancer, as she was only five years old. After returning home from vacation in April 2012, we noticed that Denali was not herself. It was very scary witnessing her sustain a seizure, and then finding out that she had a mass on her spleen. We were able to successfully have her spleen removed but then found out a month later that the cancer had now spread to her liver, and the biopsy revealed that her cancer was malignant histiocytic sarcoma. Making the hardest decision yet so far of our lives, we chose to make sure that Denali would not suffer any longer. Exactly one year ago from now, on June 2nd, 2012, Denali was euthanized. We believe a lot of these issues came from improper breeding of dogs, seeing that Denali’s mother was only nine months old at the time. We never realized that this was such a huge issue, but doing research on breeders showed how common these unfortunate actions are. 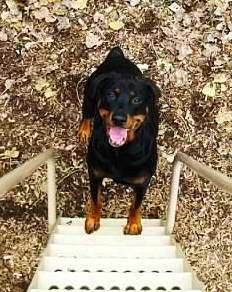 This organization came highly recommended through a friend of the family, and what’s even more special is that one of the many miracles this organization does is they’ve saved and rescued Rottweiler puppy mills located in the area. The founder is always looking for donations, as well as foster parents to help her organization run and adopt dogs. 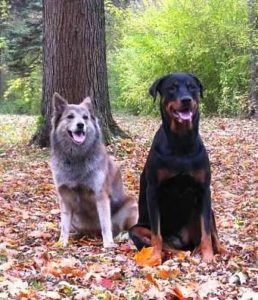 In memory of Denali, we are looking to advocate and support this organization in hopes to stop improper breeding. Please donate whatever you can on behalf of Denali, if you feel that she has touched you in anyway. We can all make a difference, and thank you for your support. We will always love you, Denali. This poor dog was dumped along a busy expressway. She was stiff from being hit by a car, and living off road killed deer. She ran from anyone who tried to lure her or catch her. 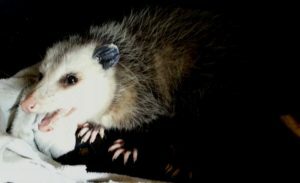 We became proactive and set up a feeding station for her, and when we saw her actually eating the food at the station, she was trapped just a few days later. She is now living at Fox Wood and learning how to trust humans again! Just a few weeks later: Happy at Fox Wood. She has free roam of the house and yard. She loves our other dogs, loves car rides and loves to go for walks at the park with her pals. She has gained considerable weight and has been dewormed, de-flead, and will be spayed soon. She is a very young dog that plays like a puppy. It is especially rewarding when she comes running to us now, instead of running away in fear as she did at first. 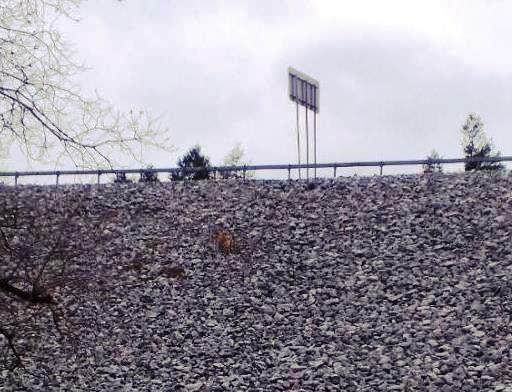 We are so glad that we noticed this sweet dog curled up by the expressway fence and decided to take action to help her!